Your new puppy, until the age of 24 weeks or so, is still a baby! They will not survive in extreme heat or cold if left outside for extended periods. Always, in the warmer months, if the dog is outside for extended periods, supply the dog with sufficient shade and maybe a plastic kiddie pool with cool, clean water for them to cool off in. Have plenty of clean water to drink in order to avoid dehydration. The size of crate should be 22"H x 24"W x 32"L or very close to it. Brands will vary in size. You may need up to 36" long as an adult. I have used music to soothe them from the time their ears opened at about 2½ weeks. It will help to play a radio on low with soft music when he is in his crate. Don't expect your new baby to hold his bladder all night long in the crate. At eight weeks old, he can last four to five hours in the crate. Do not feed him within three hours of bedtime and no water for at least a full hour before bed. Do not put water in the crate. Take him out to relieve himself (give him enough time to urinate and defecate). Try not to let the pup out of the kennel until first thing in the morning, and before he starts to cry or yelp. You don't want him to get the idea that being noisy is a one-way ticket to play time. If he is crying in the morning, you can't wait for him to be quiet, as he has been in all night and needs to get out. If you think he absolutely needs to go out to go potty during the night, let him out then put him right back in until morning. Do not engage him much, don't play or get him excited. Praise lightly for going potty outside and put him right back in the crate. In the morning, let the pup out immediately and take him outside to the place where you wish to establish this for him. Hearing you move around will automatically trigger their response to urinate and start to yelp, so don't make coffee etc., before tending to the pup until he is older and can hold it better. Be sure to praise the pup and say "go potty" as he's going. You're already training for going potty on command. Check the crate to be sure there were no accidents. Never put a pup in a dirty kennel. Your goal is for him to want to remain in a clean kennel and therefore work harder at holding it. Do not let him fall asleep and take a nap right before bed time. It will just make him start yapping when he wakes up and then goes into the crate. Keep him awake and tire him out until it is time for the crate. You can cover the crate with a sheet if he won't quiet down. I have been training them in crates for a week or so. This really helps to get a head start on crate training for my customers. They have been crated for up to four to five hours at a time. As their bladders and kidneys grow, they can stay in longer. Be sure to put in a chew bone, like a Nyla bone or other hard chew toy. You can give a small treat to them in the crate, but not a meal. They can't hold all that food for eight hours in the crate and they need ample access to water with their food to avoid bloat. House training will move along quickly if you pay attention to their body language. He can't talk, so it's up to you to learn his language! For the first few weeks while his internal organs are growing in order to hold more, he will go potty within seconds to minutes of eating or drinking. Know this and be ready! The minute he's done eating, take him out. The minute he starts sniffing the ground intensively or going in circles, take him out. Keep him in a smaller confined area, such as a room or two, where you can watch his every move. If you are diligent about this early on, it will take a lot less time to be successful. When he starts to go in the house, rush to him saying "aaacht!" Do not punish him! Just take him outside and tell him to go potty and praise him when he does. It's not a crime to have to go to the bathroom; you're just teaching him where to do it. After all, you wouldn't punish a human baby for doing the same thing! They are already accustomed to going potty on cedar shavings, so put a large litter box of them at the door you want him to use to go outside. For a couple of days, praise him every time he goes in the cedar, establishing that this is where he should run to. Then start taking him right outside when he approaches the cedar. Never put the pup's nose in feces or urine to punish him. After he's done the deed, it is too late. You've got to catch him while he's going for him to make the connection. This is why it is so important to keep him in one room where you're watching him all the time. If he establishes a spot in the house that you don't know about, it will be more difficult and time-consuming to be successful. Left to make his own decisions, his idea of what he can do is not governed by whether you consider it good or bad. A puppy figures if he is able to do something, it must be okay. Train by prevention and positive reinforcement. If he is properly watched, he won't get the chance to create problems. When he starts to chew on something, say "no", take him away from what he's doing and give him something he can chew on. Plush toys are great, but if he starts to chew them up to where he can get a squeaker out or the stuffing, take it away from him and give him something he can chew to shreds. Rawhides are okay, but too much can constipate. One every couple of weeks is enough and pig ears are better. A rag with a knot in the middle is good. Rotate toys so he doesn't get bored and ignore all of them. Miniature American Shepherds love to gather all their stuff in one area, so they can keep an eye on it or lay on it, so keep a variety available to him. Never play aggressive tug of war with your dog; it will create aggressiveness that you will have problems with later. If you want to play Frisbee, get the soft one first. Many dogs are known to have soft mouths and will be more eager to play if he doesn't get his mouth all sore right from the start. The soft ones float in water as well, so your older dog won't have to go underwater to retrieve it. Start tossing it only a few feet to start with and toss it directly to him. Make it easy and give him a chance to build confidence. Puppy proof your home! All medications should be put away, as well as mouthwash, soap, toothpaste, deodorants, etc. These are all poisonous to pups. Dogs love the taste of radiator fluid and it will kill them in a matter of minutes! Chocolate is also poisonous and raisins and grapes can be deadly. They have a very difficult time digesting any pork products. No ham. An occasional pig ear is fine. Remove all plants from the floor area. Almost all plants are poisonous, as well as outside plants, especially ornamental ones. All ivy, poinsettia, Jerusalem cherry, philodendron, all bulbs, foxglove, holly, azalea, all mushrooms, and the list goes on. If your dog vomits up any part of a plant, it is extremely important that you take it with you to the vet for identification for appropriate treatment. Confine your pup, when you can't keep an eye on him, either in a crate or a pet gated area. If all these things are lying around, then virtually everything in his new world that he tries to explore, he will be reprimanded for. You'll be saying "no" a thousand times a day and it will lose its meaning. Dogs do not tolerate small critters such as gerbils. Keep them separated. It is best to introduce other family dogs off the home property. This way the older dog does not feel the need to protect the owners or home area at the initial meeting. When introducing another dog or cat, leave the pup in his crate and let the others approach and get acquainted. When that goes well, hold the pup in your lap firmly but gently and let the others approach as they wish. Puppies will lick and bite at an older dogs face. Do not allow this. In the wild, the older dogs would come back from a hunt; the puppies would bite and lick for the dog to regurgitate the food to feed them. So this is a very natural thing, but should be nipped in the bud. Older dogs hate it. Teach your pup to respect other pets by not letting them chase or pester them beyond what the other pet wants. If he starts biting or even placing teeth on skin, say "aacht" (a high pitched sound), and walk away. "If you bite, I won't play" is the message sent. If he continues when you come back, use just one or two fingers and tap the top of his muzzle one good time and say "No bite." Then forgive him and act like nothing happened. Give him something he can chew on or tear at. Do not roughhouse, which encourages the biting! Never play tug with a puppy. It can pull puppy teeth out too soon or deform the bite. Get a couple of braided and knotted toys. Thoroughly wet the rope and put on wax paper in the freezer until frozen. The cold relieves teething pain. Give this toy outside the crate and watch them with it. Switch out when thawed to another frozen one. Do not allow them to ingest any of it. Cut off the fringes if they start to ingest it. It is necessary for them to have plenty of items to chew on, so they won't get frustrated with the discomfort of teething with nothing to relieve it. If the puppy starts to jump up or nip at your heels (being a herding breed, this is natural but they must be taught that humans are not to be herded), carry a flyswatter and waive it sharply back and forth behind you at floor level. Don't say anything. When he gets too close, he will get it in the face. He will learn to give you more personal space. Move it with purpose, not in a playful manner. Purchase a puppy training collar, which is a flat collar with a short piece of chain as part of it (refer to picture). Do not use a buckle collar; it encourages pulling. 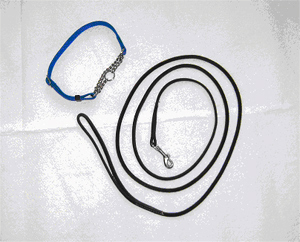 Also purchase a leather six-foot leash with a lightweight clasp. A heavy clasp really works against you and the collar which you are trying to keep loose and comfortable. Always have soft treats with you when you are walking on leash. When the puppy pulls, bend close to the ground, and coax him to you with praise and a treat. It will be much easier for both of you if you work on training with your local trainer, who can be right there to help if things are not coming along easily. We will send you the information on the food the puppies are currently eating to help prepare for their arrival. You can slowly transition to the brand of food of your choice. Do not feed puppy food, it encourages too much bone growth, but not the soft tissue and can result in deformed limbs. Feed ½-¾ cup kibble only, three times a day. If they don't eat it all, pick it up in 15 minutes. When they start ignoring the middle day meal, go to ¾-1 cup twice a day. If they are disinterested in eating, you can add a tablespoon of wet food mixed with warm water to make a broth. Do not feed canned food only, as it will adhere to the teeth with no kibble to clean it away, and will cause diarrhea. You can add three tablespoons canned food with each meal when they are about 4 months old. Mix it well or he may only eat the canned food. Canned food goes bad quickly; take away any food that hasn't been eaten after 10 minutes. Always have clean water available to them. Do not feed from your table, as this will create begging and other bad habits. Dogs have a hard time digesting pork products - no ham! An occasional pig's ear is fine. You can give them a bully stick to chew on, but take it away when it gets small enough for them to swallow a chunk. There are a number of other treats that you can gradually add to their diets. I have treated them with Pupperoni® and Canine Carryouts®. Use very small, soft pieces when treating. For videos and more information, visit Fran's YouTube channel: Fran Withers Dynasty Aussies.